Thrill Ballard Locks Centennial Celebration! Thrill Mercer Island "Night of the Zombies"
Thrill The World is the annual worldwide simultaneous dance of Michael Jackson's "Thriller" for world record and charity. December, 2017 marked the 34th anniversary of his Thriller video. Each year in October the Seattle Thrillers join Thriller groups in other nations to perform at the same exact time. The next Thrill The World performance will be Saturday, October 26th, 2019 at Occidental Park in Pioneer Square. Thrill The World is not a flash mob as the media is contacted prior to the performance. In October, 2016, King 5 attended Thrill The World Seattle in Occidental Park and posted their video of the performance on their Facebook page. Their video of the Seattle Thrillers went viral with over 500K views, over 9k shares, and over 3k comments from all over the world. The local group also performs at other events in the Seattle area for various organizations. If you live in the greater Seattle area and would like to learn the dance in a class setting, rehearsals will resume September, 2019. It is free to learn the dance and there is no charge to the public on the day of the worldwide event, however, donations to charity will be accepted at all rehearsals and directly following the Thrill The World performance. The Seattle Thrillers will be raising money for Jubilee Women's Center, http://www.jwcenter.org/ "Rebuilding lives, one extraordinary woman at a time. Led by the guiding principle that women of all races and cultures are to be treated with respect and dignity. Jubilee provides programs and services that empower women to make positive life changes." 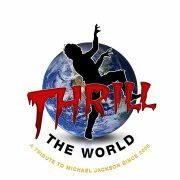 Thrill The World was created by Ines Markeljevic proving to you that you CAN dance!